Translation of: Lycklig den som Dunne f ar. A stand-alone follow-up to the acclaimed and beloved chapter books that began with New York Times Notable Book My Happy Life. What do you do if your best friend lives in another city and the adults can't keep their promises about when you'll see her? You have to sort it out for yourself! Dani's father is away and Dani is staying with her grandparents. 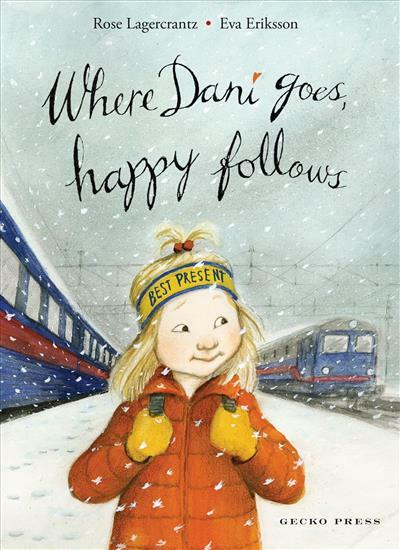 When she is invited to Ella's party, she thinks of the world's best gift for the world's best friend: she, Dani, will be the present! Her grandmother agrees--if she's brave enough to take the train alone. So Dani sets out on a journey all by herself. Rose Lagercrantz is a popular Swedish author of books for children as well as for adults. She has received many literary awards, including the August Prize and the Astrid Lindgren Prize. Eva Eriksson is one of the world's great illustrators. She is consistently nominated for the Hans Christian Andersen and other international awards.